Rust en Vreugd, in Buitenkant Street, now an art gallery, is one of the few impressive and beautifully finished town houses that survived from the eighteenth century. It is situated on land that, according to old maps of Cape Town, had already been granted to a free burgher in the 17th century as a “private garden “. It remained an extensive estate until late in the 19th century. The date of the house cannot be established, with certainty, but it is assumed that it was given more or less its present form by the notorious Fiscal Willem Cornelius Boer, who owned the estate from 1777 -1782. Although this house is much grander and more pretentious than the average, it was built to the plan of a typical double-storied, flat-roofed 18th century town house. The most distinctive feature of the house is its stoep and it is the highly ornamental fascade that draws immediate attention. Steps paved with blue slate from Robben Island lead to the raised or “high” stoep under which there are cellars. On the stoep there is a colonnade supporting a balcony resting on four massive, fluted columns of teak with Corinthian headpieces. This balcony is very reminiscent of the famous “kat” in the Castle. The front door and the balcony door are also of teak and the decorative fanlights are unique. They are not only regarded as the best examples of the sculptor Anton Anreith’s sculptures in wood, but as the finest specimens of architectural woodwork that have survived. In other respects the house conforms to the plan of an 18th century town house. From the stoep one entered the “voorhuis” with a reception room on either side, from there one passed through to the “agterhuis” which usually served as a dining room and opened out into a courtyard. On one side of the courtyard was the kitchen and pantry; on the other were the bedrooms. On the upper floor, reached by means of a stair from the “agterhuis”, were a drawing room, bedrooms, bathroom and a storeroom. At the entrance Boers installed fine wrought-iron gates with the name Rust en Vreugd and the date 1778 worked into the design. These gates were sold a hundred years later in 1878 during the governorship of Sir Bartle Frere and now form the chancel arch and gates of the parish church in Penkridge, Staffordshire, England. Lord Charles Somerset occupied it throughout the period of his governorship. After this it served as a government building, at first to houseguests who could not be accommodated in Government House, and then as part of the old Roeland Street Normal College. In 1925 it became for a time the main building of the Cape Town High School. 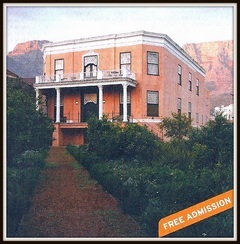 In the course of time the building deteriorated, but the late Dr. Otto du Plessis, as Administrator of the Cape, decided to have it restored for use as an art gallery. He did not live to see this aim fulfilled, but his successor, the Hon. Dr. D. F. Malan, generously carried out the project as a mark of honour to him so that the building has to a large extent been restored to its erstwhile glory.